The Union Budget for 2015 was presented today by Arun Jaitely. The tax slabs have remain unchanged but there have been some changes in terms of Transport Allowance, Medical Insurance benefits and exemption for Physically challenged tax payers. There is no change in income tax slabs except additional 2% increase in cess for super rich (i.e. individuals with income > 1 crore). For Income Tax Purpose – citizens above age of 60 are considered as Senior Citizens and above age of 80 are considered Very Senior citizens. 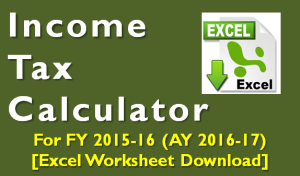 You can also download Income Tax Calculator for FY 2014-15, FY 2013-14, FY 2012-13 and FY 2011-12 by clicking on respective links. Where do you want to send its details? What details? This is really wonderful calculation, gives me lot of clarity. Do you have anything like this ( Calculator ) for Company. Can you suggest any article which you have written for companies. Sorry don’t have anything related to company as I am mostly into persona finance. I have Home TOP up Loan can I claim tax benefit for it? along with Home Loan? You can get tax benefit similar to home loan if the top up loan was used to buy a house. You should have relevant proofs of the transaction. No for AY 2016-17 there was no additional benefit for home loan interest u/s80EE. However it has been again introduced in this year budget and would be applicable for AY 2017-18. Bank had asked me to submit form 15G for the bank to not to deduct TDS on my FD. My total salary for last financial year was 7 lakhs and will almost be the same this year too. Can I sign and give this form 15G. ? No you should not as your income crosses the tax income limit. In fact it would be illegal if you do so and can be fined/punished by I-T department. So actually who all can submit 15G? Here you go – Who can submit Form 15G and Form 15H? The banks deduct TDS on RD/FD every year irrespective of maturity time. So if you have paid taxes in accordance to the TDS you would already have paid most of the taxes irrespective of the maturity date.